Are you concerned with higher heating bills? Is your central heating system not quite keeping you warm and comfortable when it is cold outside? Would a fireplace be a good solution? Can a fireplace heat your entire home? The answer is Yes! But several conditions must be met. Wood fireplaces with a sealed door, ceramic glass and certified to EPA’s standard (or CSA B415 in Canada) are designed to burn wood very efficiently and to generate a generous amount of heat. Make sure to select ones with a variable air control, as it will allow you to adjust the intensity of the fire in order to adapt your heat output to what you really need. Direct-vent gas fireplaces with a ceramic glass that offer Energuide efficiency ratings above 70% with BTUs higher than 30,000 may be suitable to heat the whole house. The house must not be too large and air circulation needs to be favorable too. Here as well, a variable heat control or a thermostat operated fireplace will help out tremendously. 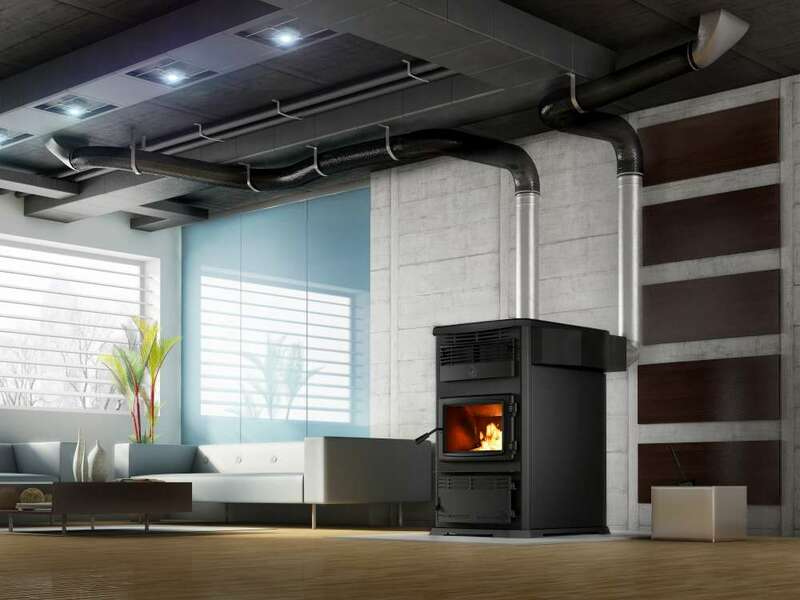 Pellet stoves are generally designed to be high efficient. They too can generate enough heat to keep your entire home warm. Look for ones with higher efficiency, typically above 70%. BTUs are also important here. The larger the home, the more BTUs it will need. The best brands of Fireplaces typically offer a ‘heat transfer kit’ or ‘forced air kit’. That option is a must if you want to heat your entire house with the fireplace! It allows for a much better heat distribution throughout the house. The concept is simple. There is a powerful fan attached to the fireplace that will pull the heat away from the fireplace and push it to a room further away or even, down in the basement. A) Wall thermostat B) 300 CFM blower C) Hot air flexible pipe D) Hot air rigid pipe E) Air register. An open masonry or steel fireplace (gas or wood) will not be able to heat your home. Actually, these open fireplaces will cool down your home in the winter, taking your warm home air up the chimney. So if your fireplace does not have sealed doors, it will not heat your home! Decorative Wood Fireplaces with no air control will supply heat, yet it will not be enough to heat more that a single room or so. Gas fireplaces with tempered glass that will have an efficiency below 60% will also produce heat just enough for a single room or so. Electric Fireplaces are also designed as space heaters and will not be able to heat an entire home. Gas Logs are normally installed inside an open masonry fireplace. They may radiate heat in front of the fireplace, but they will not be able to heat an entire home. If your local code allows for vent-free gas logs, it will actually produce more heat than vented ones, but it will be limited to zone heating, not the entire home. How to choose the right fireplace to heat my entire home? To determine the right amount of BTU needed to heat your entire home, you may find this BTU Calculator helpful. Depending on where you live, the size of your home, the insulation levels and number of windows, the amount of heat needed will vary greatly. Once a BTU range is determined, you need to decide the fuel type of fireplace you want. The 3 obvious options are wood, gas or pellet fireplaces. Do you want a fireplace per se or a freestanding stove? The location of the fireplace plays a great role as well. The more central it is, the better for heat distribution. Keep in mind that heat rises naturally. If the intent is to keep the basement warm, having the fireplace on the upper level will not help. Also, a fireplace radiates heat. The room where the fireplace is will be much warmer than rooms that are further away. Knowing this tells you that it may feel too hot near the fireplace while at the same time other rooms may feel a little cold. The temperature throughout the house will not be even when you’re heating your entire home with a fireplace. Will I be saving money doing it? It depends. Cordwood remains the cheapest way to heat a home, but there’s work involved. As Henry Ford stated it: Cut your own wood and it will warm you twice! With pellet and gas, you may or may not end up saving money. But your home will be way more comfortable. Savings will depend on your current heating source. If your central heating system is on propane or oil, savings will be there for you. If it is electricity, it all depends on the price you pay for it. In most regions, there are savings to be made using a fireplace to heat your home when compared to electricity. The We Love Fire experts already use fireplaces to heat their homes and even their stores. They know what’s involved in making it work. They will assist you in making the right choice when your goal is to heat your entire home using a fireplace. Ambiance Fireplaces, Enerzone, Valcourt, Napoleon, Supreme, Hearthstone.